Those familiar with the works of Edogawa Rampo (the pseudonym for Japanese critic and contributor to the evolution of mystery fiction) may already expect Rampo Kitan: Game of Laplace to be an immersive mystery series, but others may be unprepared for the unusual series that pushes boundaries in various aspects. The series is referenced as teetering between artistic and grim, which, on many levels, is an accurate depiction of Rampo Kitan. At the center of the mystery anime series is middle school student Kobayashi, someone who has grown extremely tired with his day to day life and seems almost numb to his surroundings until one day when he finds himself in a crime scene of the murder of his teacher. The case became highly publicized by media outlets, prompting high school student and renowned detective Akechi (Yes, it’s already strange, but just roll with it for now.) to insert himself into the fray. Akechi had been known to be seeking any sort of solitude from society as frequently as possible, but, when Kobayashi sticks around, his ways began to adapt even when he doesn’t seem to show much interest. After clearing Kobayashi of murder, he allows him to become an assistant for incoming cases that takes them down a trail of connected murders — all tying back to a group of vigilante “heroes” labeled Twenty Faces. This kicks off a team of detectives (all under 18, not-so shockingly) to do their best to stop Twenty Faces from growing into a far more dangerous force of nature. 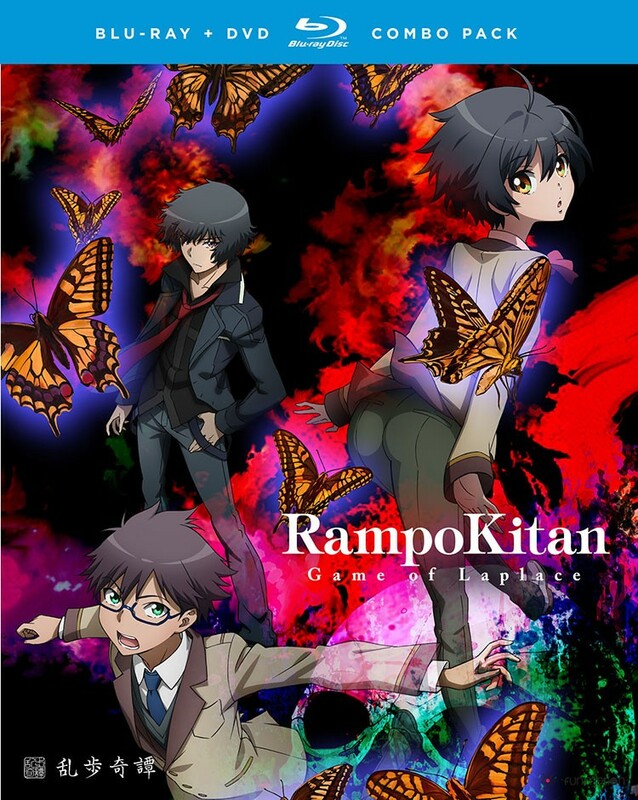 Initially, there doesn’t seem to be an overarching plot in Rampo Kitan: Game of Laplace, but, with time, you begin to notice the recurrence between two things: the constant appearance of Twenty Faces and a mysterious person in Akechi’s life. There are a few moments that suggest a grand story, but an issue with Rampo Kitan is that it takes its time to really utilize those elements and acts when it’s almost too late. I will say that those more serious moments are a strong part of the memorable traits in the anime series, and I found myself invested in random storylines or slight aspects in the 11 episode run. Having an appreciation for animes with horror or mystery, there were fulfilling thematic instances — but with that comes the flaw of going too far (which Rampo Kitan does sporadically). A storyline involving kidnapping and innuendos of worse things is hard to stomach, mostly because there has the shock value goal in mind. Instead of leaving certain things unsaid, it’s guilty of crossing a few lines, which can isolate viewers. In terms of characters, the protagonist Kobayashi is probably the most difficult character to actually enjoy in Rampo Kitan. He is someone who uses boredom as his reason for investigating, which establishes him as some sort of sociopath without real moral regard for anyone other than when he is turned down (practically) by another character whose attention he spent the series seeking. In that life or death moment (quite literally), he shows possibly his only example of genuine human emotion apart from desire or selfishness. To top off his already aggravating role, he is portrayed as a frail, feminine character (including his body type, voice, hair, clothing and everything you can think of) that is privy to fanservice. It’s apparent that the series wanted to use a gay male character to fill the fanservice void but with the most unnecessary ways, such as making him a teenager who is pursued by men of all ages and entering dangerous (or inappropriate) waters. There are a few characters who actually impress in Rampo Kitan, such as Akechi and the character he has a past with, Namikoshi. Akechi is present from the very beginning; however, Namikoshi doesn’t get much developed screen time until the final arc of the season. The relationship between the two characters is something we begin to see unfold over time that plays a big role in the antagonistic development in Rampo Kitan. The ending provided a unique choice that other animes would have never dreamed of, involving the pair and Kobayashi (though there is an unfortunate turn, too). Another character I instantly felt compassion for was Shadow Man, someone you never saw in actuality but was a ray of hope in the anime for his strong attachments that enforced the emotional impact at play. Rampo Kitan: Game of Laplace has a strong argument as to why the artistry sets it apart from other series. There is a sense of imagery appearing in fragments, and the atmosphere is filled with darker shades that, when mixed with intricate settings or character art, really feels like a complete production (specifically Akechi’s apartment). For such strong art, it can also be hazardous to the anime — for example, the inappropriate and cringeworthy depiction of Kobayashi and the recurring female character Black Lizard. As predicted, the voice casting for Kobayashi plays up his female personality and almost bizarre fetish (or perversion), but, aside from him, the remaining voice cast stands strong with a solid lineup and fitting for the core characters. Rampo Kitam has a lot of potential with mystery, emotional development and artistry, but plenty of times the actual strengths from the series are cast to the background when it chooses to embrace fanservice — something that countless animes have already brought to the table. – Akechi and Namikoshi were a great balance of close characters, but their role in the plot did sometimes make me feel like I was watching an entirely different series. – The Shadow Man could have easily been a bigger presence in Rampo Kitan, and it’s a common mistake animes make when they choose to cast interesting characters aside. – Honestly, if Rampo Kitan would have entirely removed Kobayashi, the series could have gone up an entire point (maybe even two) because of how problematic his role was. – There were flashback sequences done that replicated stage productions — easily one of the strong suits of a series that sways back and forth between inappropriate and interesting.